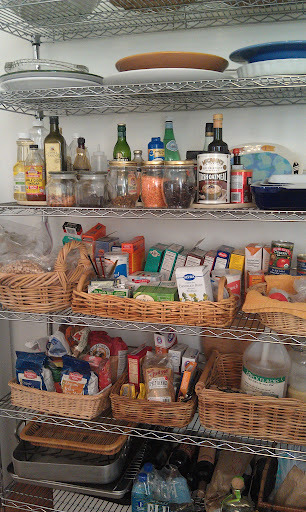 To ensure that it will be easier to follow an alkaline diet, stock your pantry with the list of Alkaline Foods that I list on my blog. Look under the archive section for post of the past that list very useful information. This is a list of foods that you should have in your pantry to make cooking alkaline a little easier. So I will share with you what is in mine. These are the most colorful cauliflowers. They come in green, purple and white. I actually prefer the white ones because they have not been genetically modified. I really likely to know what I’m eating. Don’t you? I went to the Farmer’s Market yesterday. I would urge you to find out where your local markets are and if you are not already going, make a plan. You will find the freshest produce. I go every week and stock my fridge with beautiful wonderful tasting produce. The farmers that I buy from pick the vegetables the day before bringing them to market. I also talk to the farmers to make sure that the food that I am buying is pesticide free. I will cooking this week and posting. Happy Thanksgiving. If you are reading this blog today you must be wondering what to eat today at the Thanksgiving meal. I try to make staying on an alkaline diet as less stressful as possible. Remember it is all about the ratio of alkaline foods( 80%) to acid foods( 20%) on your plate. If this is your favorite holiday and you want to indulge a little more than usual. Try a( 60%) alkaline foods and( 40%) acid foods. You actually stay in a comfort zone but can have a few extra treats without upsetting your diet. And don’t forget that we can store alkaline foods in our bodies. So I suggest that you eat an alkaline breakfast, oatmeal, or a fresh fruit smoothie and for lunch a light vegetable salad or a bowl of vegetable soup. I always eat breakfast and lunch especially before a big dinner. This way I am not starving when I sit down and I can make better choices of what foods I am putting on my plate. So if Turkey is your thing, go for it. Enjoy the sweet potatoes and mashed potatoes with it. And don’t forget the vegetable dishes. When dessert is served, look for the fresh fruit. If there is a pie that you just have to have, try to just have a taste. It usually takes about 20 minutes to feel full, so if you eat slowly and your dinner lasts 20 minutes, dessert will not be so tempting. That is my secret for today. You will be surprised how easy it is to stay Alkaline and have a Happy Thanksgiving Holiday. 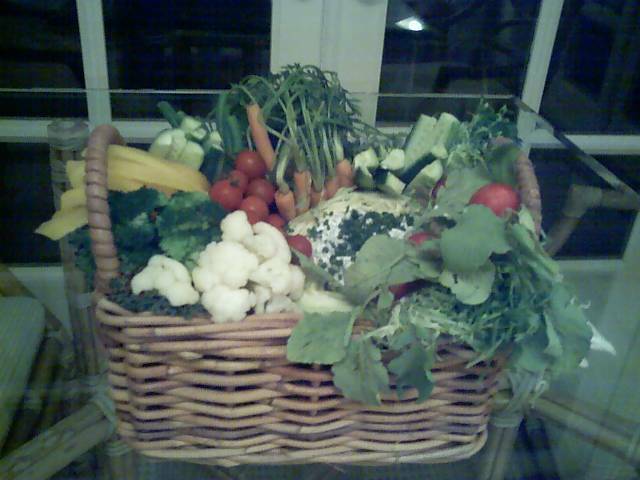 This is another vegetable basket that I recently made to bring to a friend’s house. It being a holiday weekend, I thought it would be a good idea to introduce it again. For this basket, I lined it with lettuce leaves to bring up the bottom of the basket. Then, just start to build as if you were walking through a garden and just picked fresh vegetables. Radish with tops on, cauliflower, broccoli(blanch the broccoli it works better) mushrooms, cherry tomatoes, carrots with the tops on, celery sticks, snap peas, red bell pepper and ½ of a purple cabbage to hold the dip. Pour the dressing into the ½ piece of cabbage. There are so many websites that give you a list of alkaline and acid foods. Have you found that they are all somewhat different? That is because there are very different schools of thought on what makes something PH Balanced. Also, every body is different. That is why it is so important to test yourself. I use these test strips to keep my body alkaline. You can order them from Amazon. Let me know when you go green! Great for entertaining. Basket size does not matter. Any basket will do. Just have fun with this. The amounts do not matter, you can make this with what you have on hand. I used, blanched cauliflower, blanched broccoli, a bunch of radishes with the tops left on. Baby carrots with tops left on. cherry tomatoes, cucumber slices, yellow bell pepper slices , celery slices, mushrooms and 1/2 of a cabbage(Take out some of the inner leaves) to hold the dip. Place the cabbage in the basket and work around it. Buy some Kale or other decorative lettuce and line a basket with the lettuce creating a bed. Start putting your vegetables in the basket, I like to make it looked like a basket of freshly picked vegetables. Did anyone happen to see the just published US guidelines for the new American Diet? We used to have a pyramid, now we have a plate. The recommendation is ½ your plate is to be fruits and vegetables, ¼ a protein and ¼ a grain. This is the Alkaline way to eat. 80 % Alkaline and 20% Acidic. We need protein in our diets. Even on an Alkaline diet. The grains we substitute for alkaline choices include: Spelt, Buckwheat, Quinoa, Japonica Rice and Wild Rice. So don’t be afraid of eating this way. It will lead you to good health. More to come! You can email me at cookalkaline@gmail.com or click on the ask button at the top of the page. I will be happy to help you with Cooking Alkaline. Being on an alkaline diet can be a little tricky when you come home looking for something to eat. I will be sharing all of my ideas with you in the coming days. The Lentil soup recipe that I posted earlier is my go to meal or snack. It is very alkaline and filled with lots of vegetables. I hope it is something you will try. If you have any questions about it, just hit the ask button on my web page. Happy Cooking! Just like your pantry, your freezer can hold a few go to items that make cooking alkaline a little easier when you have to plan a last minute meal. I want to give you a list of foods that you should have in your pantry to make cooking alkaline a little easier. So I will share with you what is in mine.